This is all Rafael Nadal’s fault, of course. If he had not been superhuman on clay for the last decade, tennis analysts would not be twisting themselves into knots trying to determine the hows and whys of his barren April. Clay — unless it is colored blue — has been Nadal’s supreme medium since he manhandled Andy Roddick in the Davis Cup final in Seville, Spain, as an 18-year-old in 2004. Ten years later, the doubts are starting to swirl like dust on a blustery day at Roland Garros. After winning 10 titles in 2013, Nadal has won two in 2014. After losing just seven matches in 2013, he has already lost five with the heart of the season — the French Open, Wimbledon and the United States Open — yet to come. But what truly arches eyebrows is to see Nadal searching for answers and winners on clay. So it went in the spring of 2011 when Novak Djokovic’s elastic powers briefly left Nadal looking befuddled. So it went in April in Nadal’s traditional strongholds as he lost in the Monte Carlo quarterfinals to David Ferrer and in the Barcelona quarterfinals to Nicolas Almagro, who celebrated as if he had just completed the Grand Slam instead of reaching the semifinals of an ATP World Tour 500 event. Taking out Nadal at Roland Garros still ranks as the ultimate challenge. And despite the doubts and struggles of his April, Nadal clearly has ample time to recover, beginning with this week’s Masters 1000 in Madrid, where he is expected to start play Wednesday against the winner of the first-round match between Juan Monaco and Jürgen Melzer. That assumes Nadal is healthy, or at least healthy enough, which can be tough to glean in an era in which the leading players rarely tell the truth about what pains them. If Nadal is hale and hearty, what he needs to do is resume generating consistent depth on shots and converting on break points and stop making uncharacteristic errors and grimaces when things do not go his way. 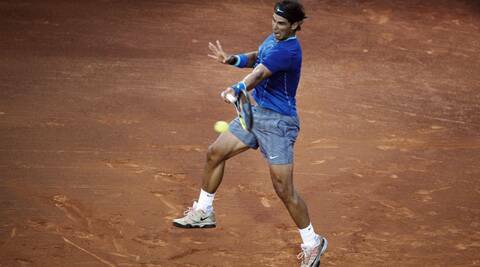 Emilio Sanchez Vicario, the former leading player and Spanish Davis Cup captain, said in an interview on Sunday that after Nadal surprised the opposition with his quick-strike, higher-risk approach in 2013, he is struggling this time to switch from hardcourts to clay. Sanchez said he also believed that Nadal’s backhand had become less reliable because of a change in footwork presumably designed to protect his fragile left knee. Nadal’s genius has been his rare blend of tennis savvy and tennis amnesia. But Nadal also tends to see danger at every turn, which can become, in periods of struggle, a self-fulfilling prophecy. Annacone does not buy the theory that Nadal is struggling to make the shift from hardcourts to clay. “What I do buy is a lot of the stuff that could be mentally or emotionally related,” he said. The comeback from injury to No.1 in 2013 had to be draining, just as his back problem and surprise loss to Stanislas Wawrinka in the Australian Open final this year had to be deflating as well as encouraging to the opposition. And so it might be reassuring for Nadal at this shaky stage to know that he will not have to worry this week about Djokovic, who overwhelmed him in the Miami final in March but withdrew from the Madrid event Sunday because of concerns about his left wrist. The uncertainty about Djokovic’s health further clouds a season in which it has been difficult to see through the mists. Andy Murray, after a back operation, has not been the same player who won Wimbledon last year. Juan Martín del Potro is out of action for an extended period because of a wrist operation. Federer has been resurgent and impressive but is not yet back to vintage Federer. Further, Djokovic has just announced that his fiancee, Jelena Ristic, was expecting their first child. For the moment, it does look slightly ajar, but when it comes to clay-court tennis, there has never been a doorman as vigilant as Nadal.